As a new nursing student, it is very important to learn medical terminology. Learning medical terminology basics will help you better understand and comprehend the material you read for nursing school. Also when you have a deeper understanding of medical terms you will be able to answer test questions on exam more efficiently. There are so many medical terms that it is impossible to memorize them all. 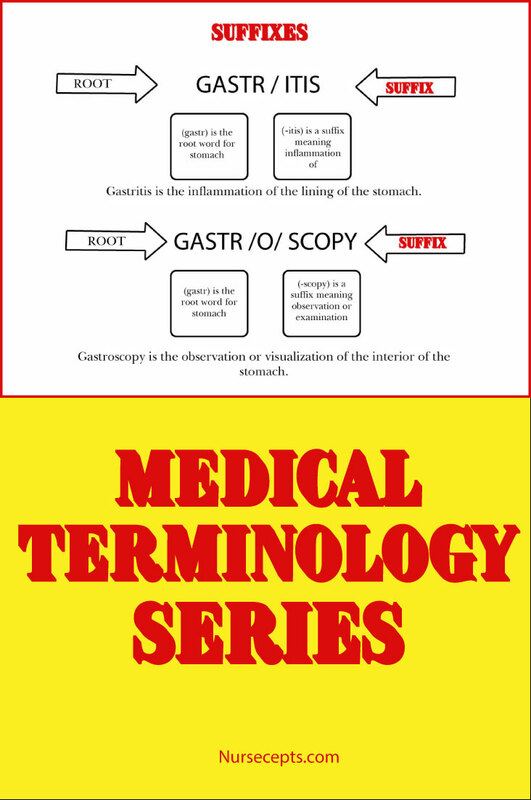 Medical terms are derived from word parts. 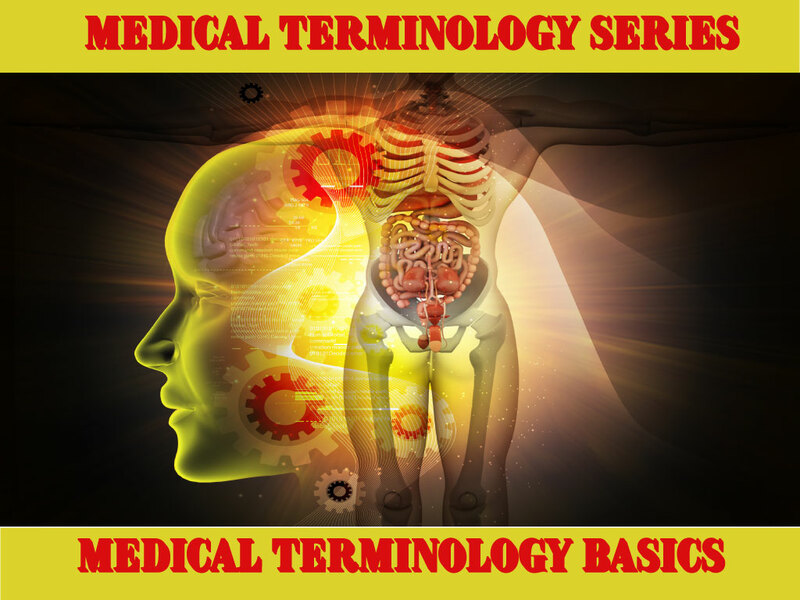 The best method of improving your knowledge of medical terminology is to understand how those word parts form the medical terms. 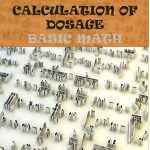 Once you have that basic understanding you can memorize the parts and be able to understand the meaning of any medical term. 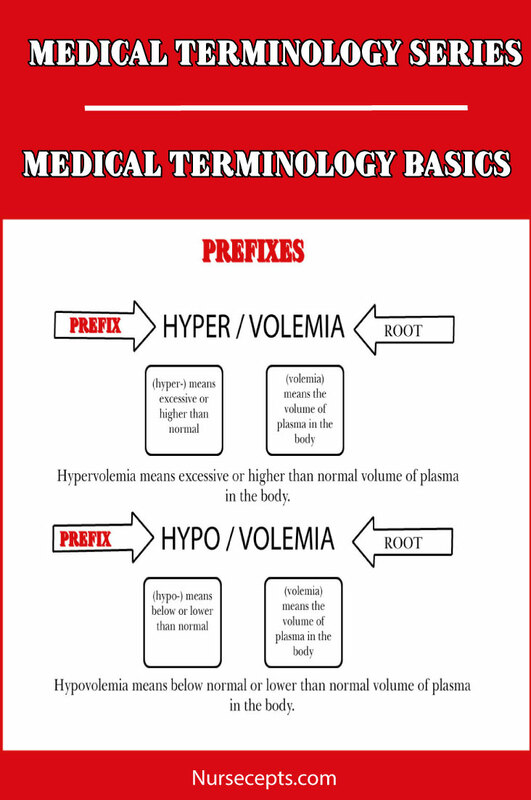 The parts that form medical terms include word roots, prefixes, suffixes and combining vowels. These parts have their origin in Greek and Latin. Below is some information on the different word parts to help you begin to build a foundation for a medical vocabulary. An important tool to have is a good medical dictionary. The word root is the main body of the word and helps with the fundamental meaning of the word. 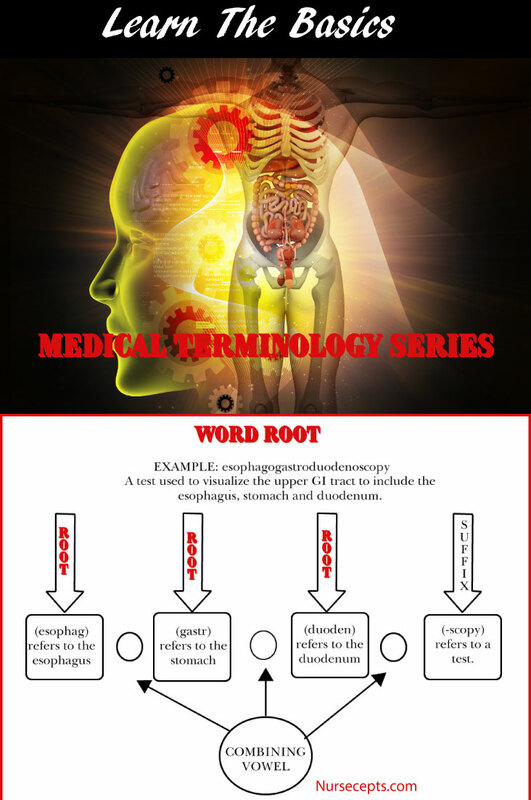 The word root will usually but not always refer to body systems, organs, anatomy, diagnosis and medical procedures. A medical term can have more than one root. We will use the example word esophagogastroduodenoscopy. 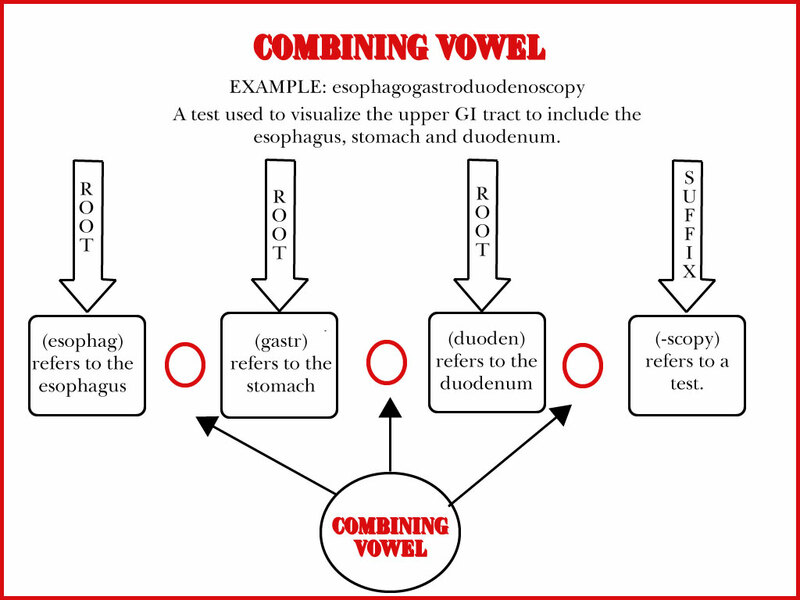 The suffix (-scopy) and the combining vowel (o) will be covered below. The prefix is placed before the word root to modify or vary the meaning. You will find that when the prefix is written detached it is commonly followed by a hyphen (-). The prefix (hyper-) means excessive or higher than normal. 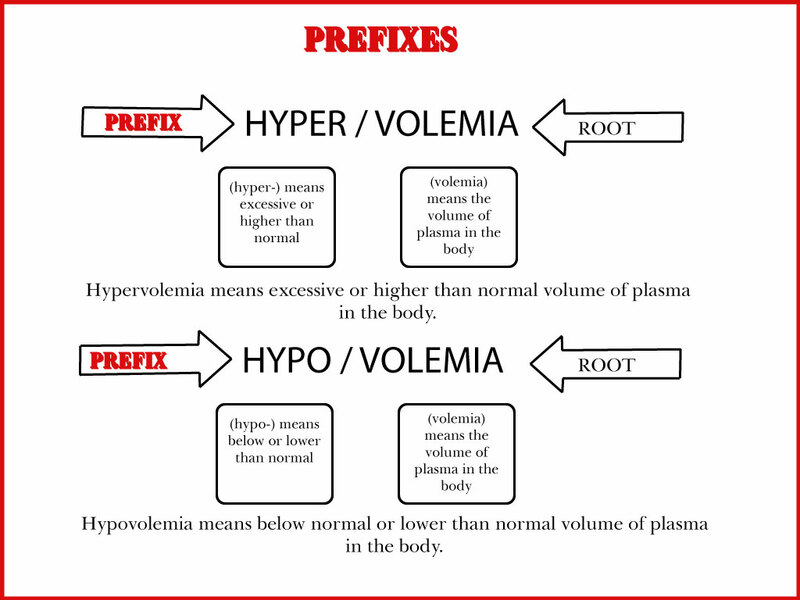 In the example below the prefix (hypo-) means below or lower than normal. The word root (volemia) means volume of plasma in the body or “the condition” of the volume of plasma in the body. The suffix is placed at the end of a word root or word part to modify or vary the meaning. Suffixes can indicate a condition, disease or a procedure. When a suffix is written detached it is preceded by a hyphen (-). This indicates that another word part precedes it. In the example below the suffix (-itis) means inflammation. 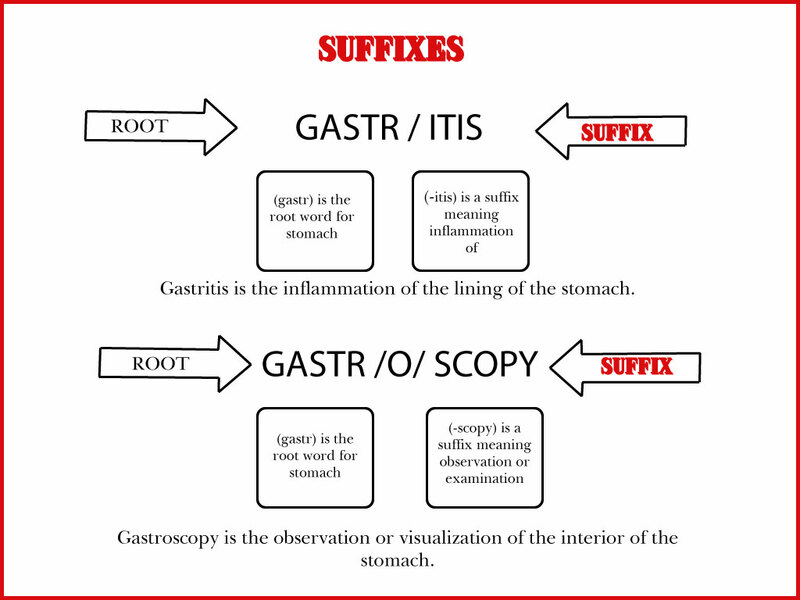 The suffix (-scopy) means observation, visualization or examination. The word root (gastr) pertains to stomach. 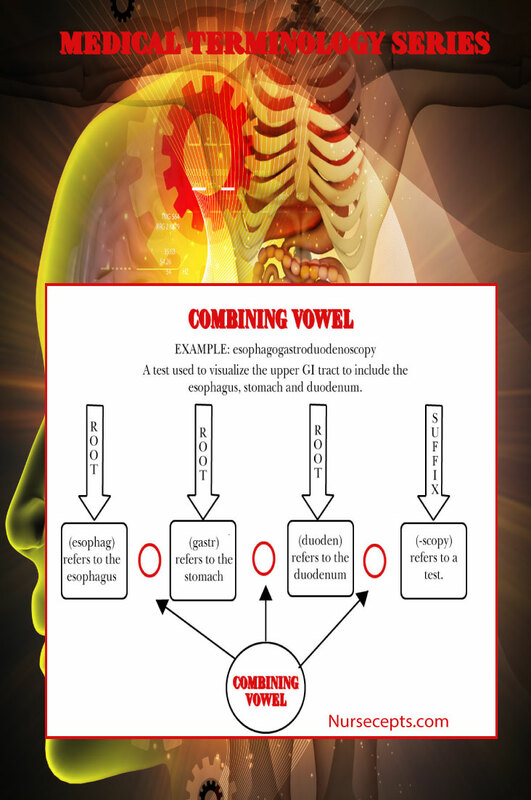 The combining vowel is usually an (o) which is often inserted between word roots to make a word easier to pronounce. 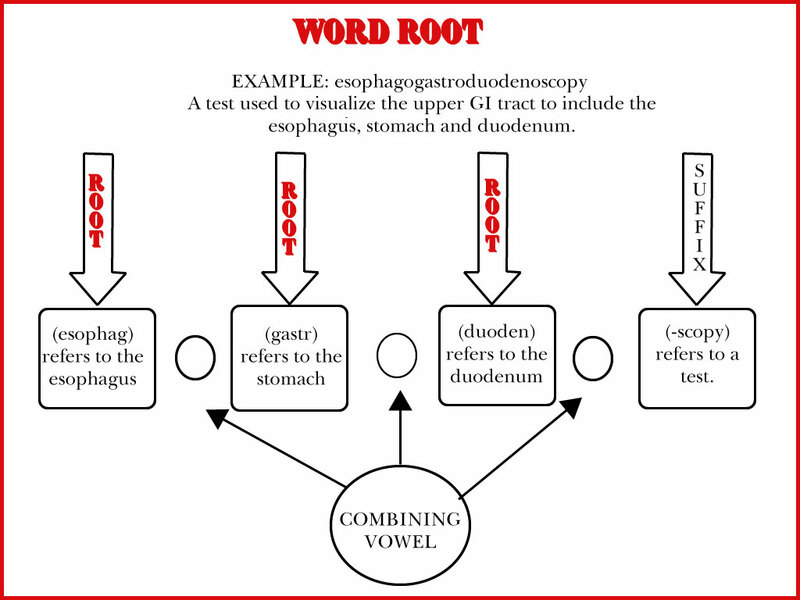 Combining vowel usually connects one word root to another word root and also connects a word root to a suffix. The combining vowel does not modify or vary the meaning. When a word root is written with a combining vowel a forward slash is used. Try saying the word without the (o)! When you evaluate a medical term, begin at the end of the word with the suffix. 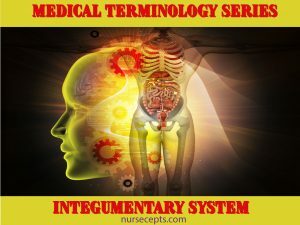 Learn the individual parts of the medical term instead of trying to learn individual words. Most every medical term has a suffix. Remember that the word root(s) gives the fundamental meaning of the word. The combining vowel doesn’t have a meaning but is used to connect more than one word root or a word root and suffix.